Busselton Heart Study 1966 Welborn, T.A. Finnish Social Insurance Institution Study 1966 Aromaa, A.
Glostrup Study 1964 Hagerup, L.M. Hisayama Study 1961 Sadoshima, S.
Los Angeles Heart Study 1949 Chapman, J.
Malmö Study 1970 Lannerstad, O.
Muscatine Study 1971 Lauer, Ronald	M.
Olmsted County Study 1965 Connolly, Daniel	C.
Puerto Rico Cardiovascular Disease Study 1965 Garcia-Palmieri, M.R. Seal Beach Study 1964 Cutler, J.
Stockholm Study 1961 Carlson, L.A.
Western Collaborative Group Study 1960 R.H. Rosenman was P-I for the incidence study (1960-1969). D.R. Ragland and R.J.Brand were the P-I's for the mortality study (1982-1983). 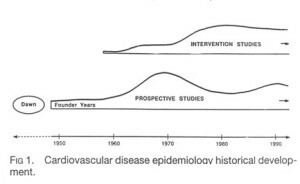 Yugoslavia Cardiovascular Disease Study 1964 Kozarevic, D.